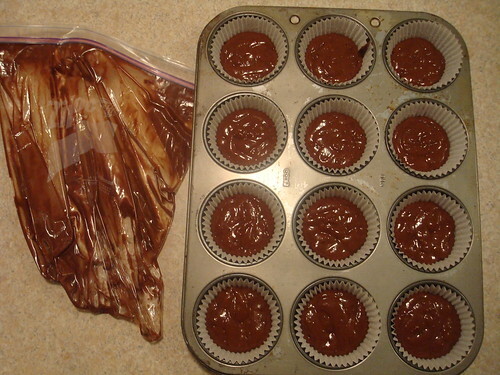 I always have trouble filling cupcake tins. It seems that no matter how careful I am I always end up with batter all over the pan. I've heard more than once to use a giant zip-top freezer bag as if it were a piping bag. I think its a great idea and here's how I do it! 1. 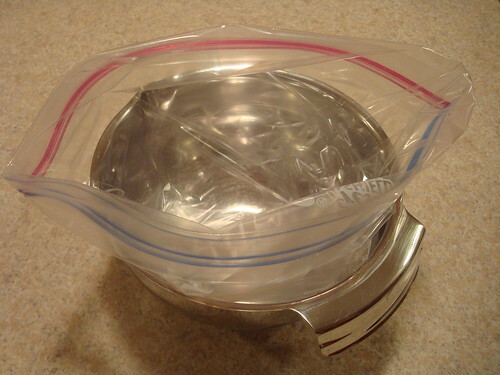 Place a 1 gallon zip-top freezer bag inside a bowl and fold the zip top down. 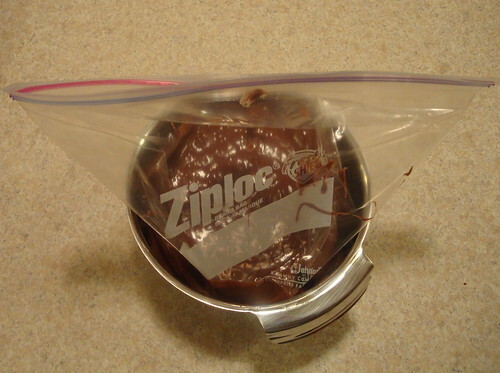 The zip-top freezer bag idea is excellent, but getting the batter from the bowl to the bag has been messy in the past for me. Until, that is, I figured out that if I put the bag inside a bowl, it would hold the bag up and open for me, especially once the bag became full of batter. No more bags tipping over and half your batter spilling all over the counter tops! I also fold the zipper top down over itself a few times. This helps the top of the bag keep an open shape. It also helps the integrity of the zipper; when it is folded over it is protected from spills and will have a watertight seal when you are ready to zip it shut. 2. Pour your batter into the bag. You will be glad you have that bowl holding your bag upright now because you will have both hands and your undivided attention to make sure all of the batter makes it into the bag. 3. Now you're glad you folded the top over, cause you dribbled anyway. I always do, even when I'm not pouring with one hand and holding the camera with the other. It happens; that's why you folded the top over. 4. Unfold the top, zip it almost all the way together leaving a small space open at one end. 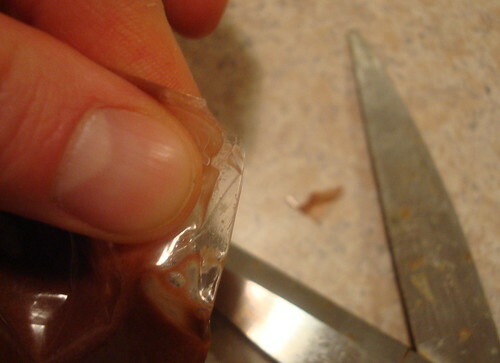 With just a small opening left, squeeze the air out the bag, then zip it completely shut. Now's your chance to wipe off the bag if you had any spills, otherwise, you are going to get it all over your hands. 5. Snip a corner. 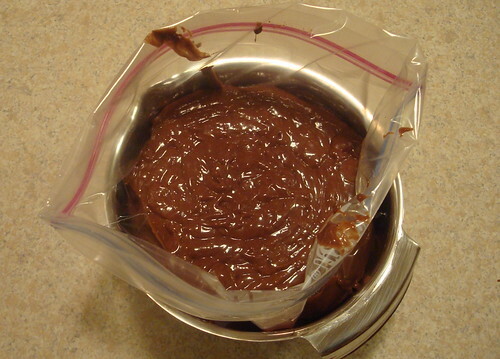 If you sealed your bag properly you can pick it up out of the bowl and tip it upside down, moving the batter away from one of the bottom corners. Pinch the corner and snip just a small amount off, leaving a hole. If the snip is too large, the batter will come pouring out and you'll have no control over it. If the snip is too small the batter will barely come out at all, temping you to squeeze the bag harder, and that's just an accident waiting to happen. 6. Fill your cups. 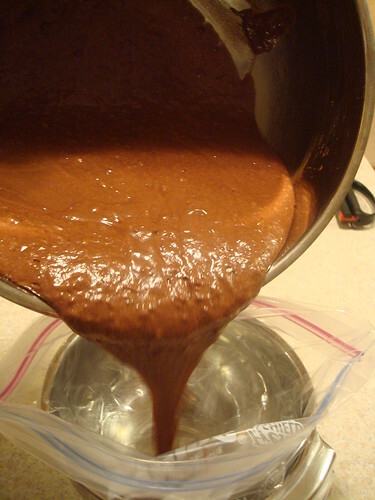 While you are still pinching that end shut, turn the bag right side up and let the batter flow back towards the open end. When you are ready, let go of your pinch and fill the cups. You can pinch the end shut when moving from cup to cup or just time your drips carefully. Squeeze, roll, fold and scrunch your bag to get every little last drop of batter out. Enjoy an easy clean up! I recommend freezer bags over regular storage bags. They are more durable and they stand up better during filling.